Members of Zero Waste Europe and the GAIA global network confronted incineration advocates today in the ‘Climate Generations Areas’ of the COP21 summit. The event was organised by Syctom, the agency in charge of waste management in Paris area, including the Ivry Incinerator redevelopment in Paris, which is actively opposed by local community group Collectif 3R and Zero Waste France. plans and higher recycling rates. The alternative, ‘Plan B’OM‘ sets out a pathway to a zero waste future free from incineration. The case of the Ivry Incinerator in Paris was recently featured in Zero Waste Europe’s report “Air Pollution from Incineration from Waste Dispoal: Not for Public Breath” which identified 5 cases of polluting incinerators across Europe which have all faced active opposition. 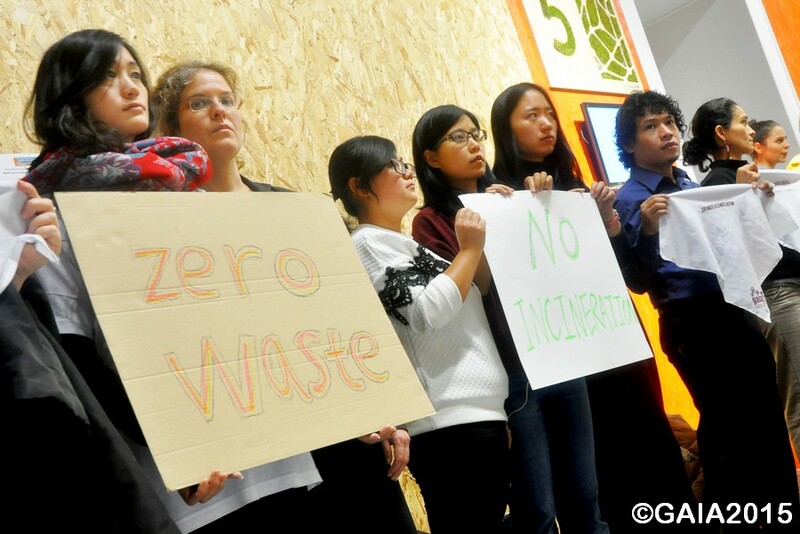 The side event at the Climate Generations Areas originally planned to showcase “bioplastics” from incinerator carbon capture systems, resulted in a significant part of the audience ‘walking-out’ in opposition to their attempted greenwashing of incineration. After the third speaker, a member of the audience stood up and spoke out in French against the presentation of incineration as green technology, calling for anyone who agreed to join them in walking-out. A large proportion of the audience proceeded to leave the event, criticising the panel for their misrepresentation of incineration technologies. The group then gathered outside the event talking about alternatives to incineration, and zero waste strategies. As the panel finally left the event there was a call for an end to incineration and an anti-incineration song was sung.